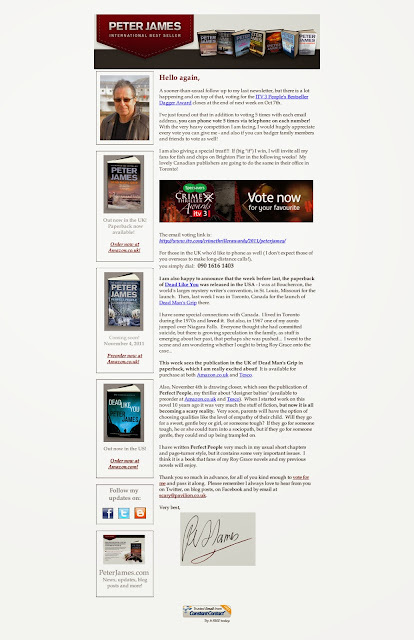 A sooner-­than-­usual follow up to my last newsletter, but there is a lot happening and on top of that, voting for the ITV 3 People’s Bestseller Dagger Award closes at the end of next week on Oct 7th. I’ve just found out that in addition to voting 5 times with each email address, you can phone vote 5 times via telephone on each number! With the very heavy competition I am facing, I would hugely appreciate every vote you can give me -­ and also if you can badger family members and friends to vote as well! I am also giving a special treat!!! If (big “if”) I win, I will invite all my fans for fish and chips on Brighton Pier in the following weeks! My lovely Canadian publishers are going to do the same in their office in Toronto! I am also happy to announce that the week before last, the paperback of Dead Like You was released in the USA -­ I was at Bouchercon, the world’s larges mystery writer’s convention, in St. Louis, Missouri for the launch. Then, last week I was in Toronto, Canada for the launch of Dead Man’s Grip there. This week sees the publication in the UK of Dead Man’s Grip in paperback, which I am really excited about! It is available for purchase at both Amazon.co.uk and Tesco. Also, November 4th is drawing closer, which sees the publication of Perfect People, my thriller about “designer babies” (available to preorder at Amazon.co.uk and Tesco). When I started work on this novel 10 years ago it was very much the stuff of fiction, but now it is all becoming a scary reality. Very soon, parents will have the option of choosing qualities like the level of empathy of their child. Will they go for a sweet, gentle boy or girl, or someone tough? If they go for someone tough, he or she could turn into a sociopath, but if they go for someone gentle, they could end up being trampled on. I have written Perfect People very much in my usual short chapters and page-­turner style, but it contains some very important issues. I think it is a book that fans of my Roy Grace novels and my previous novels will enjoy. Thank you so much in advance, for all of you kind enough to vote for me and pass it along. Please remember I always love to hear from you on Twitter, on blog posts, on Facebook and by email at scary@pavilion.co.uk.